I have been dying to try a gradient for as long as I can remember. So as a reward for sitting through my three hour LSAT class, I decided to sit down to watch Project Runway and break out the nail polish. And I couldn't believe how easy it turned out to be, using just nail polish and a makeup sponge. Here are the five polishes that I used. You can use less, or even more if you're ambitious, but it's up to you. These shades aren't mandatory at all, go with what you have. I found that these were a nice gradient of blue and even though Blue Iguana was substantially lighter than Sapphire Blue, I think it really made the manicure pop in the end. So take that under consideration. Also, if you're thinking about using a black with some sparkle like I did, use one that is a true black that's not grainy. Black Diamond looks okay on the tips, but being nitpicky, I didn't really love the grainy look and feel of it in the end. It doesn't blend as well as another black. You may be better off using a black satin color and then adding a hint of glitter with a top coat at the end. But it's totally up to you! Are you ready to become a gradient pro? Well, let's get started! 1) Tape your fingers. I can't tell you how much easier this would have made my life, considering how hard it is to get blue nail polish off without staining your skin. One pieces on each side of the nail and right below would make your manicure much cleaner looking. Take my word for it. 2) Apply two coats of your lightest blue. 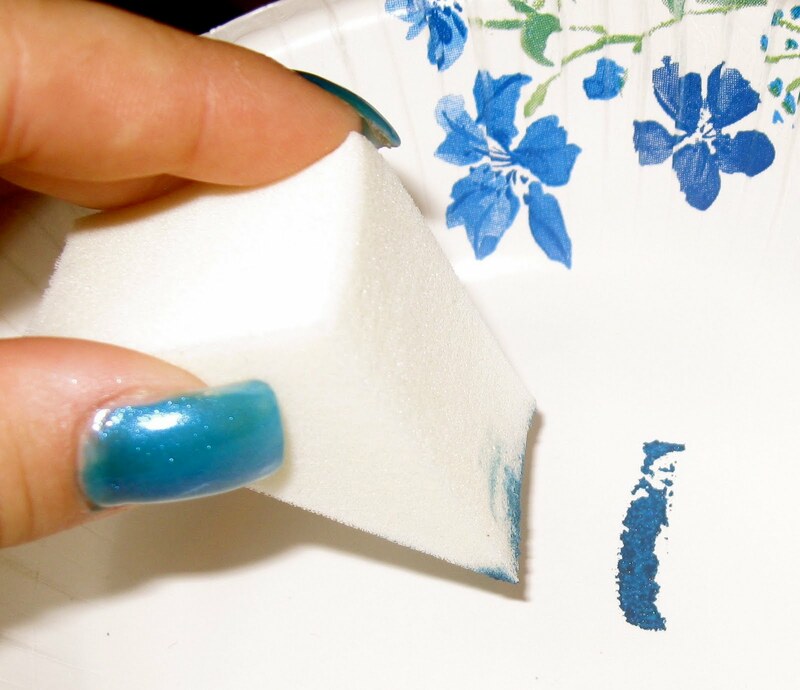 3) Using your second blue, swipe a line of polish across the WHOLE tip of your makeup sponge and dab it twice on a nonporous surface (in my case, a paper bowl) to prevent uneven sponging. IMPORTANT: Wait until your base polish is only slightly sticky to the touch before you start the sponging process or you'll create goopy bumps that will ruin your hard work. I promise, the extra wait is worth it. 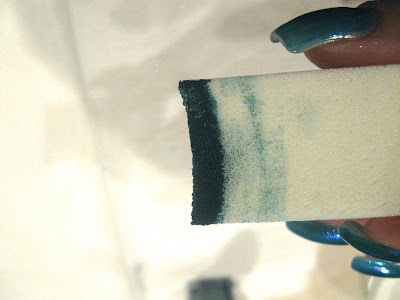 4) Starting at the tip of the nail and using the whole width of the sponge so it curves around your nail, lightly dab the sponge down your nail, leaving a small amount of your base color at the bottom. If you notice that the polish did not sponge well to the sides of your nail, repeat the sponging process using the corner of the sponge on those bare areas. 5) Repeat steps 4 and 5 for as many colors as you desire, EXCEPT your last color, lessening the length of the sponged area as you go. 6) For your last color, apply the polish to the sponge as your did for the others. When you dab this time, do so until you barely see any polish on the plate/bowl. This will make the color much sheerer on the nail, but will look like a more even blend. This may require more than one repeat of sponging until you get a true dark tip (in my case, black), but it will look blended instead of just a painted tip. Don't worry that your nails look spongy, that will be solved in the next step. 7) Now, remove your tape and apply a top coat! I use Seche Vite because I find it creates the smoothest surface, especially when using grainy glitter or sponging. Plus, it's dry time cannot be beat. Pretty. I will have to try this.